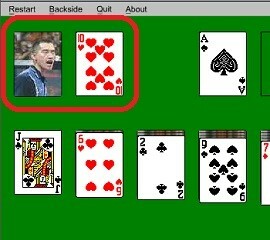 To begin playing Basic Solitaire, click the Small, Medium, or Large link or Very Large button under the picture at left. This opens the game in a pop-up window. To start playing, click the "Enter" button at the bottom of the game. Like most card games, this solitaire game trains concentration and visual memory. This version is played using modified Klondike rules (see below). Because these modified Klondike rules are somewhat lenient compared to strict Klondike, you actually have a fairly good chance at winning each round. HOW TO PLAY. There are many variations of playing card solitaire, but this basic Solitaire version uses Klondike rules which are one of the oldest. This games uses a standard 52-card deck of playing cards. The cards, from lowest to highest in value, are: Aces, Kings, Queens, Jacks, 10s, 9s, 8s, 7s, 6s, 5s, 4s, 3s, and 2s. The goal of basic Solitaire is to unsort the mixed playing cards and stack them into four separate piles by suit. If you successfully sort all the cards, you win. If you become stuck, you lose. Place Aces in one of the four available slots in the upper right. Then build your suits (Hearts, Clubs, Diamonds, and Spades) from your Aces. For example, if you have an Ace of Hearts placed in a slot, place the deuce of Hearts (2 of Hearts) on top of that. Follow with the three of Hearts, four of Hearts, and so on all the way up to the King of Hearts. The stock cards are available from the stack in the upper left. When you need a card, click the back of the face-down card to reveal the card. The up-face card can then be played in the upper four slots or the lower seven slots as possible. The seven slots in the lower section of the game are used to sort cards in order but in alternating colors. For example, if an uncovered red 7 (Heart or Diamond) is showing in one of these stacks, you can place a black 6 (Spade or Club) on top. Follow this by a red 5, then a black 4, etc. When one of the seven slots at the bottom is empty, it is referred to as an empty tableau pile. In this version of solitaire, only a King (any suit) can be moved to an empty tableau pile slot. HISTORY OF KLONDIKE SOLITAIRE. As it happens, Klondike solitaire is thought to be over a century old dating back to the Klondike gold rush in America. The game of solitaire itself (also known as Patience) goes back even further. 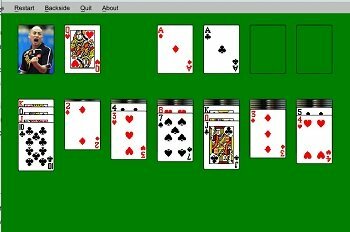 The earliest versions of solitaire originated in Europe in the late 1700's.